Switching to a low carb diet (Ketogenic Diet) has really changed how I fuel during a run and has totally impacted my life – truly. Today is day 44 in ketosis and every day I feel that this is becoming a lifestyle. How many diets out there can really be maintained long term? I can live like this! I don’t even miss the sweets, chips, or even my weekly donuts. I would eat maybe two bags a chips a week . . . not to mention the Butterfingers and Twix. Racing Weight: Is it just low carb magic? Weight has something to do with it too. My Leadville race weight, before the race, was 163-165 and as of today I weigh 147. I am not even putting in hard miles either – maybe 30 mile avg weeks. As of now, I am at 12% body fat, but I am shooting for 8%. I read Racing Weight: How to Get Lean for Peak Performance by Matt Fitzgerald, about a year ago and and it was a good book; I enjoyed it. The main thing I got out of it is, loose 10% of weight you will improve your performance by 10%. Now, I didn’t loose any weight from reading it and I was putting in hard miles training for Leadville??? I just accepted that 160 was my weight. Since I have been in ketosis, the weight just seemed to fall off; it was amazing. Looking at my recent 10k, I improved by 10% after loosing 10% of my weight since my last 10K. Tons of variables, but I think it was the weight. Feeling a bit depleted coming into Seattle Bar (mile 26.4) I knew I was in for a rough patch. I’ve been working with my diet and energy burning the last month to try to figure out my stomach issues once and for all. I’ve basically taken grain carbs out of my diet and have been sticking to veggies, meat, nuts and fruit. 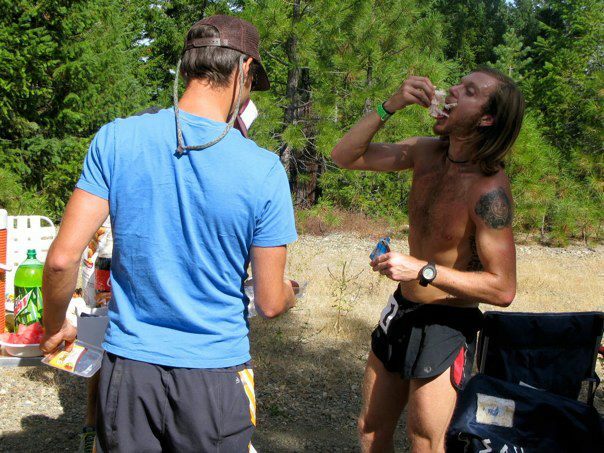 My food choices are as natural as possible, making fat my fuel as I run mountains. I do use carbs, but try to use them strategically to make my body as efficient as possible. I’m also supplementing with an incredible product called VESPA, an amino acid supplement that helps my body stabilizes energy, metabolize fat and optimize recovery. I’m still working on it and those first 5 hours of running I should have eaten a little more. I was on about 100 calories an hour and it came back to haunt me later. Rookie mistake, yet I look forward to completely dialing in my nutrition for running and daily living. One positive of the day was that using VESPA, my stomach was the best it’s ever felt, which I’m sure i wouldn’t mind getting used to!